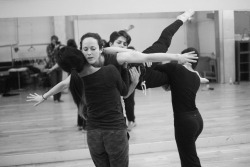 LEVYdance rehearsals for ALONE / TOGETHER are underway. Z Space is thrilled to have commissioned this amazing piece, coming to our main stage June 7th - 11th. Directed by LEVYdance Artistic Director Garance Marneur in collaboration with visual artist Paolo Salvagione and LEVYdance company and guest artists. This immersive and experiential evening-length work explores the moments when loneliness and togetherness run up against one another. Each scene is culled from the memories of the dancers, and features interactive devices that were developed specifically for this production by Autodesk artist in residence Paolo Salvagione. Newer Posthow many stage managers does it take to pack a production up to travel in france?